(Bloomberg) -- Senior U.S. Treasury official David Malpass was appointed president of the World Bank Group, placing a loyalist of President Donald Trump at the helm of the development lender. Malpass was unanimously selected to serve a five-year term from April 9, the World Bank’s executive board said in a statement on Friday. 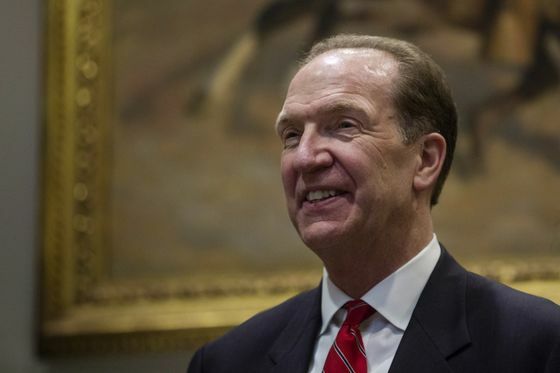 Trump nominated Malpass in February, choosing a loyal supporter who had been sharply critical of China and called for a shakeup of the global economic order. Critics including Nobel laureate Joseph Stiglitz questioned the selection, pointing to Malpass’s doubts about international cooperation. But no other countries proposed any candidates to challenge Malpass, making his selection by the board all but assured. Before his nomination, Malpass portrayed the World Bank as too big, inefficient and reluctant to cut funding for developing countries that grow into dynamic emerging markets. He pushed the bank to lend less to China, arguing the world’s second-biggest economy has the financial resources to support itself. Since being nominated, Malpass has adopted a gentler tone, noting he was America’s lead negotiator on a package of reforms under which the bank will receive a $13 billion capital increase. Under the plan, the bank will focus more lending on lower-income countries. Malpass succeeds Jim Yong Kim, who stepped down Feb. 1 to join an investment firm. Kristalina Georgieva, chief executive officer of the bank, has been acting as the interim president. Malpass, 63, had served as Treasury undersecretary for international affairs under Trump. In that role, he represented the U.S. at international economic gatherings including Group of 20 summits and the IMF and World Bank meetings. He’s previously held senior posts at the Treasury and State departments under Ronald Reagan and George H. W. Bush. He served as chief economist at Bear Stearns, an investment bank that collapsed during the global financial crisis.